Review by AllTheBestFights.com: 2016-12-10, good fight between Jermall Charlo and Julian Williams: it gets three stars. 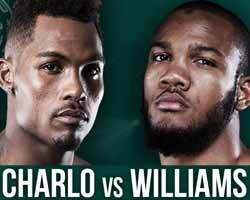 Both undefeated, the Ibf super-Ww champion Jermall Charlo entered this fight with a perfect record of 24-0-0 (18 KOs=75%) and he is ranked as the No.4 super welterweight in the world (currently the #1 in this division is Saul ‘Canelo’ Alvarez) while his opponent, Julian Williams, has an official record of 22-0-1 (14 knockouts) and he entered as the No.9 in the same weight class. Both boxers have fought once in 2016: Charlo has beat Austin Trout (=Charlo vs Trout) while Williams has defeated Marcello Matano (=Williams vs Matano). Charlo vs Williams is valid for the IBF World super welterweight title (Charlo’s third defense); undercard of Jesus Andres Cuellar vs Abner Mares. Watch the video and rate this fight!